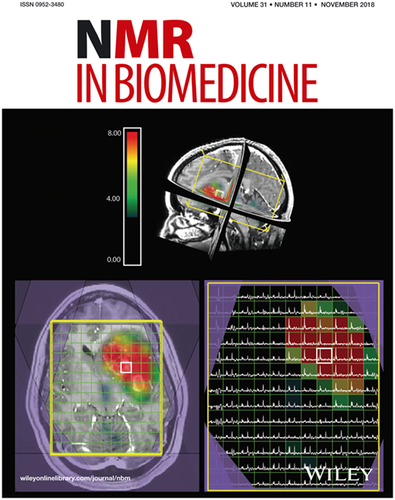 The goal of this study was to find the most robust algorithm for a phase‐sensitive coil combination of 3D single‐cycle and lactate‐edited, multi‐channel H‐1 point‐resolved spectroscopy (PRESS) localized echo planar spectroscopic imaging (EPSI) data for clinical applications in the brain. Data were acquired over 5–10 minutes at 3T using 8‐ or 32‐channel array coils. Peak referencing with residual water and N‐acetyl‐aspartate, first‐point phasing, generalized least squared (GLS) and whitened singular‐value decomposition (WSVD) combination algorithms were evaluated relative to unsuppressed water with data from a phantom, six volunteers and 55 patients with brain tumors. Comparison metrics were signal‐to‐noise ratio, coefficient of variance and percent signal increase. Where residual water was present, using it as a reference peak for phasing and weighting factors from an imaging calibration scan gave the best overall performance. Greater improvement was seen for large selected volumes (>720 cm3) and for the 32‐channel array (25%) compared with the 8‐channel array (19%). Applying voxel‐by‐voxel phase corrections produced a larger increase in performance for the 32‐ versus 8‐channel coil. We conclude that, for clinically relevant 3D H‐1 PRESS localized EPSI studies, the most robust technique employed individual phase maps generated from high residual water and individual amplitude maps generated from calibration scans.